No-stretch nylon with fiberglass composite shells. This ankle brace can be used by athletes playing on a less forgiving indoor surface, such as basketball, volleyball and tennis. The Ultra Ankle Full Court brace prevents rotation and inversion forces with a no stretch nylon strap and two fiberglass composite shells. This ankle brace is engineered to provide flexible ankle support while assisting with stabilization of the ankle in a tight fitting shoe. 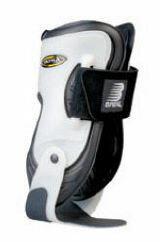 Patented Lock-Down-Cuff restricts excessive rotational and inversion forces. The Breg Ultra Ankle XT is still available. Great Ankle Brace for both indoor and outdoor surfaces.